New Product update: The Solar Spa Water Heating Pads shown below have now been replaced by a new lightweight, durable clear Solar Water Heating Film that works better than the pads, but is less than 1/3 the cost, prevents dust, leaf and flying bug intrusion, and can easily be cut to fit any size pool under 8'. We no longer need a water surface template from customers--only the size and general shape of the spa or pool, and this unique new design has a variety of other practical uses. Use the PayPal order links at the bottom of the page to place your order. on a 7' above ground spa by owner Valerie for our first spa tests in Spring. is better and the film and is 1/3 the cost, at less than $100 for large spas. Here is the least expensive way to warm the water in your home hot tub or small pool using only the free energy from the sun. Installation takes only minutes using our new clear Solar Water Heating Film. It's made of a special blend of non-toxic flexible polymer plastics that allows over 90% of the sun's light and heat to pass through while nearly eliminating heat-reduction evaporation. This is an entirely new water heating design that's sure to change the way sunlit spas and small pools receive their primary heat. 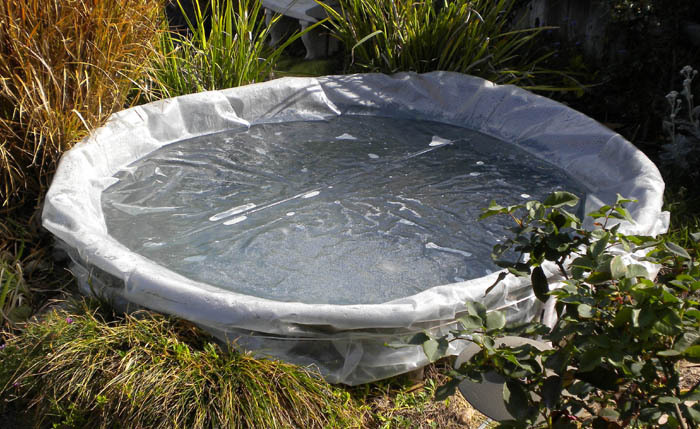 You can also use them to reduce water freezing in small ponds or animal water troughs. No pumps, pipes, valves or expensive exterior heating panels are required so the savings is considerably lower that any other type of water heating. Every surface area on earth that's exposed to the sun absorbs direct solar energy all day long, even on cloudy days. That energy is transformed to heat as soon as it touches an object. The sunnier the day, the warmer it gets. If you trap that absorbed energy with a clear dome or transparent covering, heat will build even more just like your car sitting in the sun with the windows rolled up. It's a scientific fact that each square foot of sunlight that touches earth can generate as much as 100 watts, or 300 BTU of heat in bright, midday sunlight. That heat can be captured in many ways--to heat air (as with our solar forced air heaters)-- or water in a typical solar water heating panel or in water heating containers such as a spa or even a dark colored tub shown below. Capturing heat directly into a small mass of water is a more efficient way to warm and store water if the water surface is covered with a clear dome or cover that prevents evaporative heat loss. Since most of the heat loss (70%) is by evaporation, a clear cover will reduce or eliminate much of the heat loss while allowing as much as 90% of the sunshine to pass through and heat the water. Water is an excellent heat absorber and thermal storage medium, especially if the bottom surface is dark colored when it's less than two feet deep. The darker the bottom surface, the warmer it gets. The less thermal mass the sun heats, the faster and hotter it will become, so shallow water in a dark covered container heats quickly. 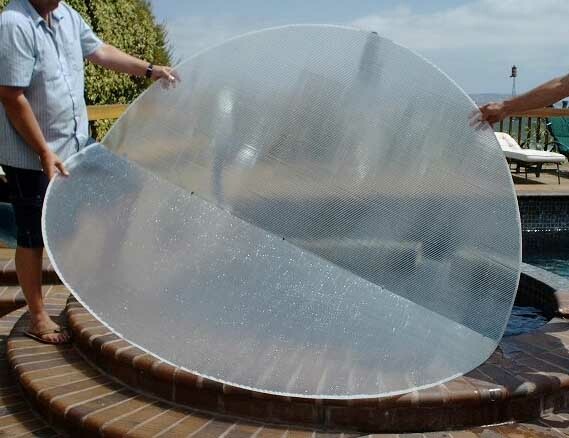 Our unique transparent ClearDome Solar Clear Water Heating Film allows solar energy to pass through from the top to the bottom of the water while it creates a solid thermal dead air barrier on the surface that prevents much of the sun's energy (now converted to heat) from escaping. In simple terms, the water in your hot tub is transformed into a giant solar heat absorber. It becomes a highly efficient direct heat generator and thermal storage tank that costs nothing to operate and requires no moving parts. Most conventional large, expensive exterior roof mounted plastic solar pool heating panels do not have the clear dome or cover protection that prevents heat loss from open air and wind dissipation -- as well from long pipe runs -- so maximum spa temperatures seldom reach 100 degrees. Also consider the expense of running the pump most of the day to recirculate the water through the exterior panels and back to the spa. It adds up, eliminating much of the cost savings from using that type of solar heating panel system. We suggest not using your pump when heating with our film to prevent heat loss through pipes and to save on high daytime electricity costs. Set the pump/filter timer to turn on at night or during normal usage when the utility rates are the lowest, unless you plan to use the spa in daylight. 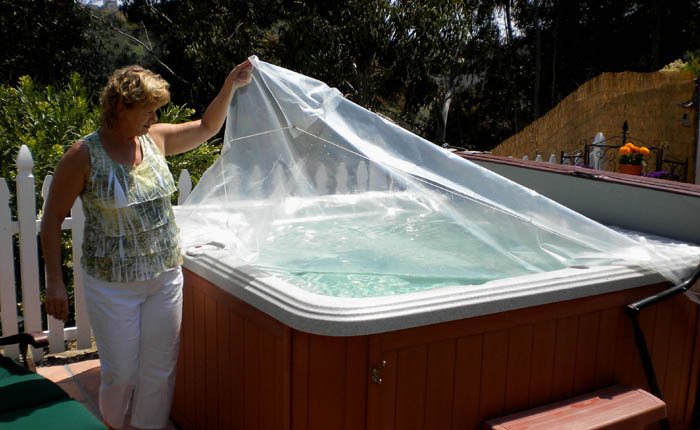 Our heavy duty 6 mill clear plastic water heating Film floats on the surface of the water and is pulled over the edge of the spa and held in place with an adjustable line that's easy to loosen and pull the film off to use the spa. For in-ground spas we suggest laying tiles or small weights on the corners of the film. Conventional colored pool and spa "heating blankets" are most effective at reducing evaporation heat loss, but lack the ability to add significant solar heat to the depth of the water because they stop most heat energy transmission at the surface. ClearDome Solar water heating film passes 92% of both visible and invisible solar energy through the water and spa interior, where it's absorbed and transformed to heat. It is UV treated to resist the most damaging sun rays, which extends the life of the film. It is far more durable than "bubble wrap" type water blankets because of the heavy duty construction. Solar heating film users can expect a 4-5+ year life when properly used, while the flexible plastic spa blankets can begin to degrade in only 1-2 years. In customer beta testing for over a year, all users have confirmed that little or no conventional heat was needed to maintain water temperatures between 100-104 degrees F on continuous sunny days in summer. In our 300 gallon test spa (seen on the left below)that has no conventional heating and only partial insulation on the bottom half of spa side, we've found that 70 degree water temps will reach about 98 degrees F after only 2 days of full solar heating with 60-70 degree daytime temps and nights in the 60's in late Spring. Well insulated hot tubs retain overnight heat better on cold nights. At night, water temperatures fell only 1-3 degrees by midnight with the film in place, so no additional heat was needed during these fall tests in San Diego. Longer, warmer days and nights will increase water temps considerably. No chemicals are added to the water, so every week the spa water is used to water plants and add to the fish pond. "I heated it just the once... to about 95 degrees then it went to about 105 that next day. Since then I haven't needed to heat it (using electric heating). I can minimize heat loss through the use of the insulated cover, but have found that unless I'm intending to do some morning soaking, It'll be fine by the time I use it in the evening..."
It purifies most foul water, including ocean or lake water, into delicious drinking water that tastes as good as solar distilled water. It's much faster than solar, as it can distill a cup of pure drinking water in 20 minutes, a gallon of in only 5-6 hours, or four gallons in a 24 hour day for about 30 cents per gallon. It's ideal for everyday use at home or work, and for most emergency situations when there is no safe drinking water available. Sale prices start at $149. A well-insulated thick foam/wooden cover helps prevent a few degrees of temperature loss at night, but we've found that on most summer nights, our previous heating pads and film actually provide similar heat loss figures within 1-3 degrees in a well-insulated spa. On warmer nights the water temperature drops only a few degrees without the cover or additional heat, as Bob relates above. Any nighttime heat loss is quickly regained the next day. On hot summer days, the film can be folded over to expose water and start evaporation to reduce excessive water heating. Folding over also slows heat loss when only a few people are using the spa. Another method to regulate heat is to shade part of the spa with your top insulating panel or a piece of dark plastic. Conventional electric or gas hot tub heaters can cost at least $75-$275 or more per month to keep the water hot because of fuel and pump costs. But as long as the sun shines, your spa water will heat 5-15 degrees F in a day for free, and lose only a few degrees at night, assuming you have adequate surrounding insulation and full all-day sun on the spa. The spa film will pay for itself in only a few months of summer use. Very little conventional heat is required to maintain 104+ degree F water temperatures in summer except on cloudy or cold days, as long as the film is in place. Your conventional heat becomes a backup system, and the hot tub season is extended since you'll still be adding solar heat, even on partly cloudy days. 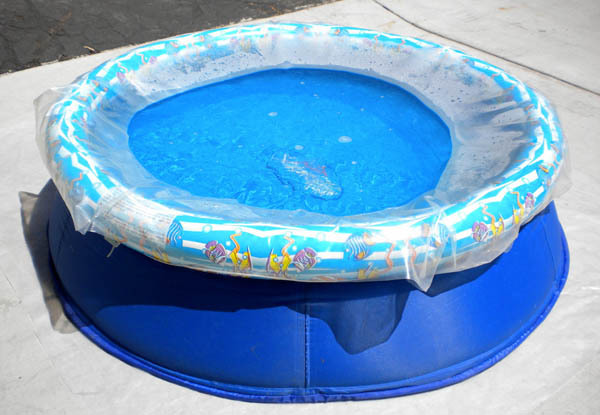 This unique solar heating product is so safe, simple and easy to use, even properly trained youngsters can install and remove it on smaller pools like the blow-up kiddy pool above. This 4 foot pool heated to mid 90 degree F temperatures on 70 degree days in about 5 hours. Your kids will enjoy the warm water. Make sure you always check the water temps before they get in because on hot summer days the water temps can reach over 100 degrees F.
Spa flim is much lighter and easier to use than convention spa heating blankets, and will remain flat on the water surface on windy days to prevent excess heat loss and evaporation. And because it is very clear, you can see always to the bottom of the spa to check for accidental fall-ins. You can heat or maintain temperatures with any sunlit home spa or small pool under 8 feet across with about 4-6 hours of direct sun. We suggest all day sun for maximum heating. ClearDome Solar water heating pads are no longer available to purchase but the new Solar Spa Film PayPal order link is. To place your order, please click on the correct PayPal order links below that match your spa or pool size and tell us if it's an in ground or above ground spa. Allow 2-3 weeks for processing and delivery. We suggest not using our solar water heating film in public spas because heavy daytime usage makes it difficult to benefit from constant film coverage. Also, we've found that removed film in public spas are seldom replaced unless a pool monitor is assigned to that duty each time the spa has been used.